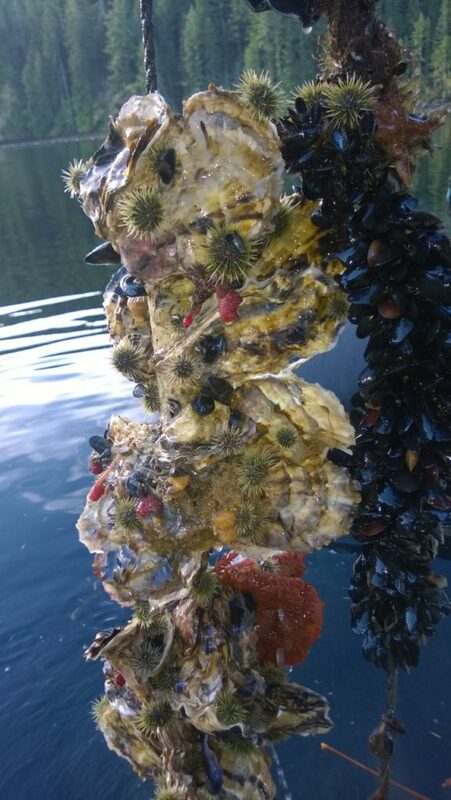 Linda's photo depicts habitat and protection provided by mussel rafts. 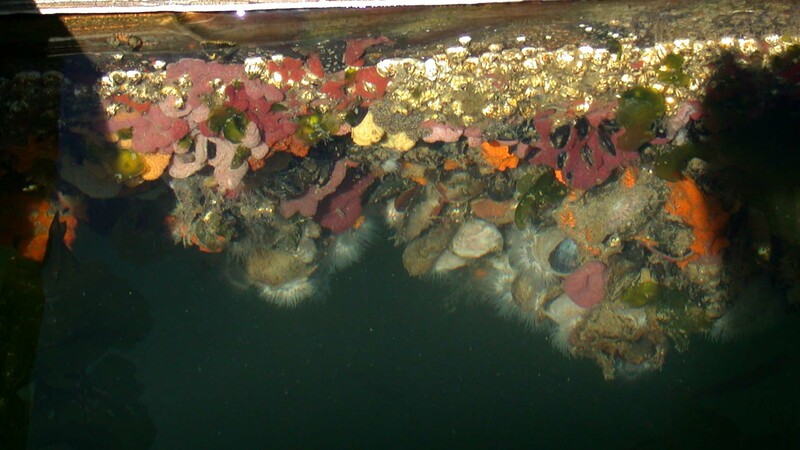 The diverse layers of organisms throughout the rafts are incredible. These pictures were taken from above the surface looking into the water. Photo taken in Olympia, WA. 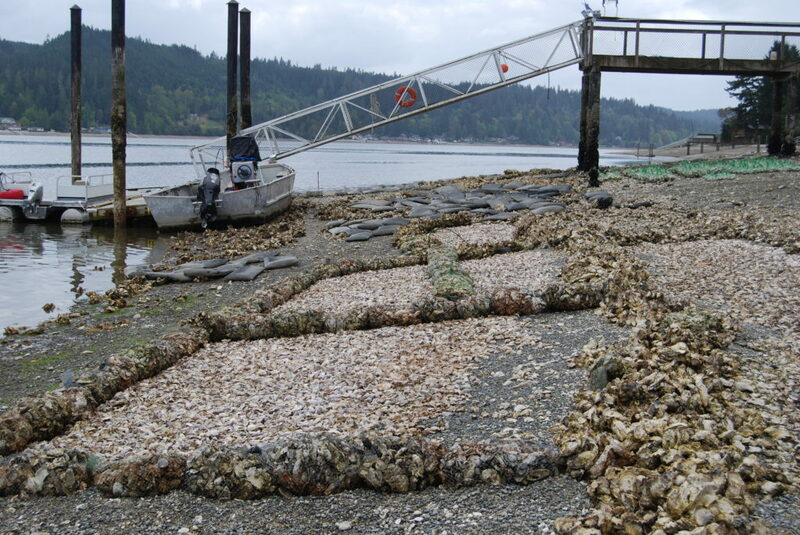 Weatherly's photo is of oyster cages and how they are great urchin habitat. 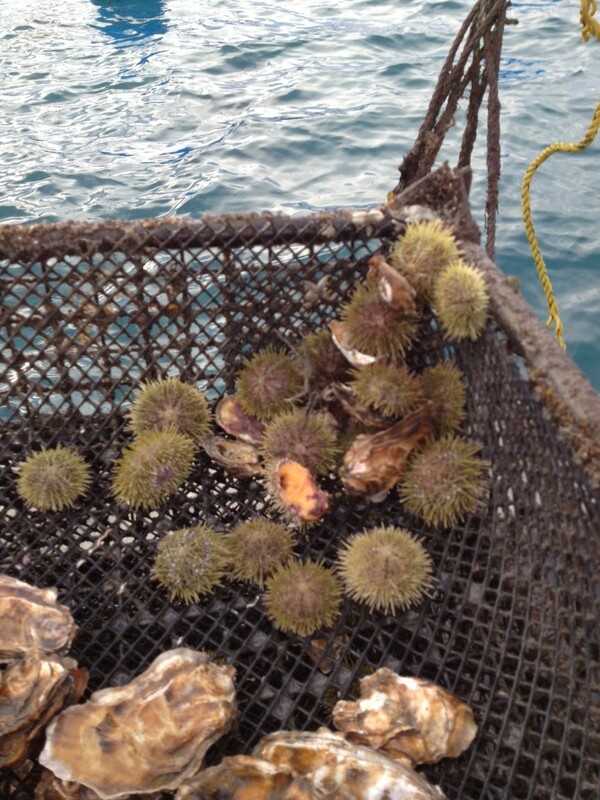 The grazing urchins help keep our cages and oysters clean. Photo taken in Homer, AK. Matt's photo is of how micro-habitat amongst sleeves used for geoduck farming supports many species of macroalgae, crustaceans, echinoderms, and sponges. 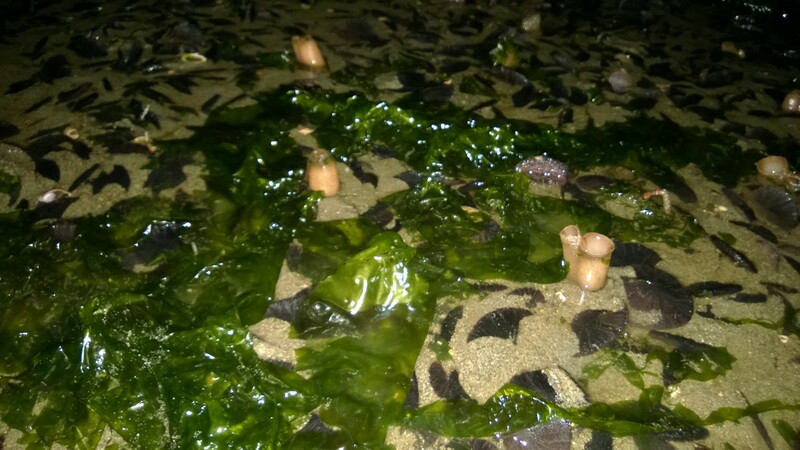 Brian's photo is of native drills gathering for spawn on a single oyster on one of their bottom culture beds. 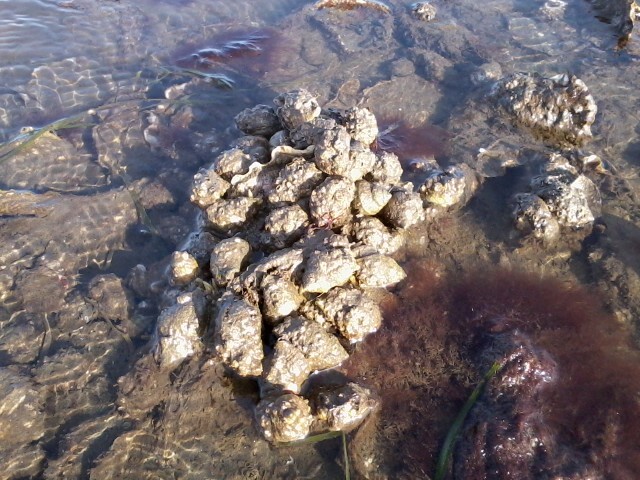 They rely on oyster, or other shells, to spawn and lay eggs. Photo taken in Ocean Park, WA. Larry's photo shows the bags of shells used as burms to hold seed oysters inside the nursery and how they catch thousands of natural oyster spat during the spawn. 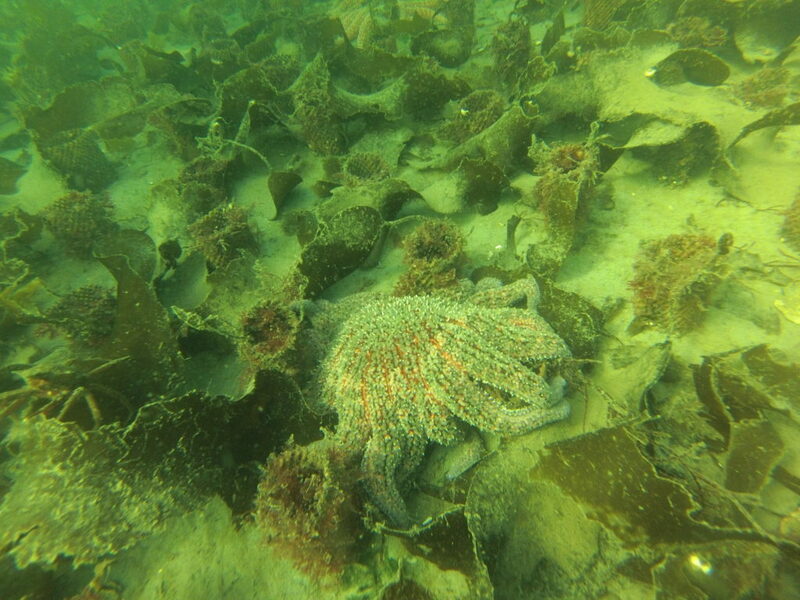 The nursery creates habitat for fish, crabs, eels, and an abundance of marine plants and animals. Photo taken in Belfair, WA. 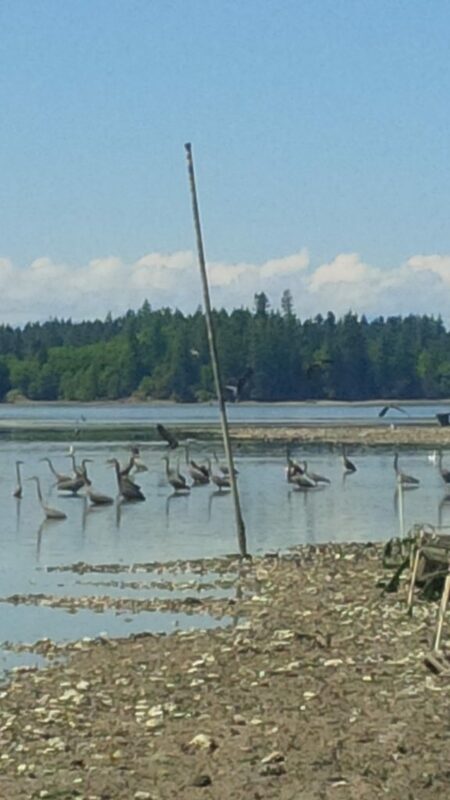 Sue's photo shows how every day, during low tide, pairs of Great Blue Herons travel from a rookery at the head of Henderson Inlet to gather on the Nisqually Indian Tribe oyster farm. Whether the oysters are grown on the ground or suspended, the habitat they provide for smaller invertebrates draws forage fish who directly benefit from the abundant food source. Photo taken in Olympia, WA. 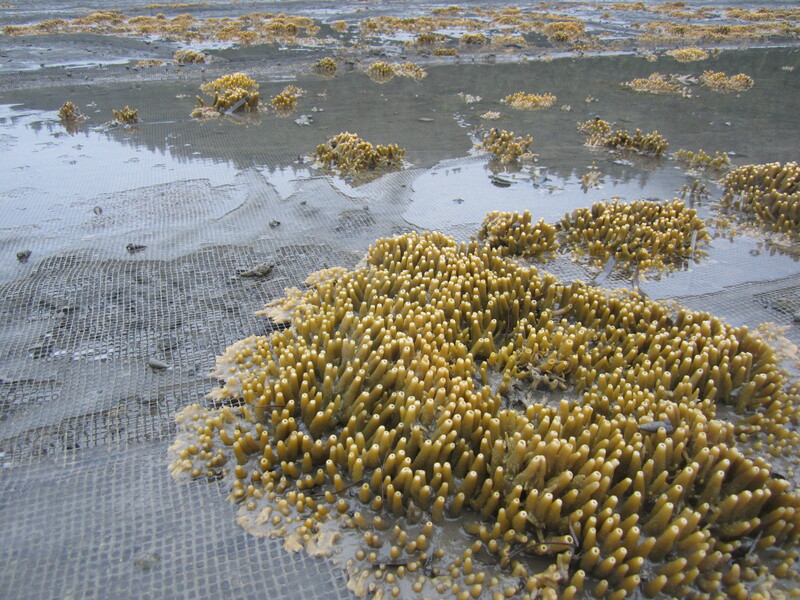 Nicole's photo shows lots of sponges (possibly breadcrumb sponges) using clam nets for habitat. Photo taken in Bellingham, WA. 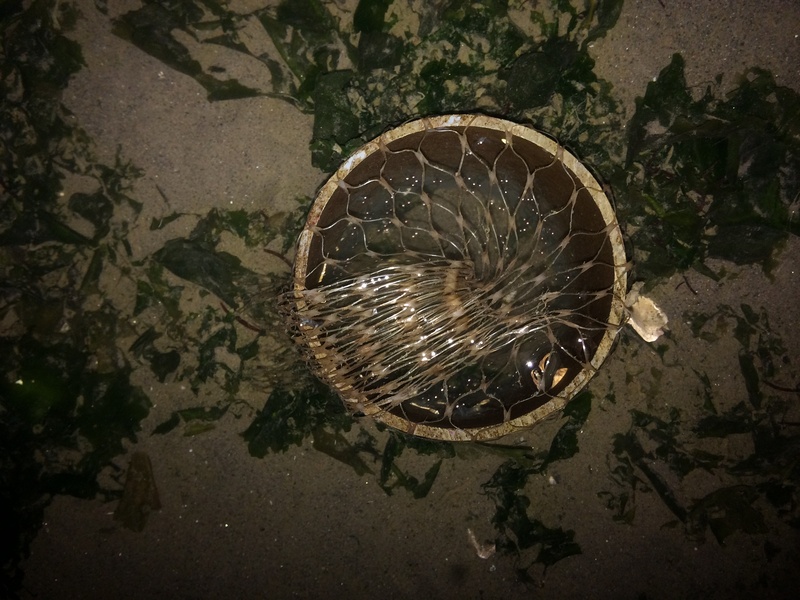 Brian's photo shows the commensal relationship between sand dollars and geoduck. Geoduck survival is higher when sand dollars are present. It would appear they limit predation on the geoduck. It might be described as mutualism as it appears the sand dollars derive some benefit as well since they actively colonize geoduck beds. Photo taken in Shelton, WA. Paul's calls his photo "floating oyster culture." As you can see there is quite the zoo, including sea urchins, mussels, and a variety of sponges. Photo taken in Shelton, WA.